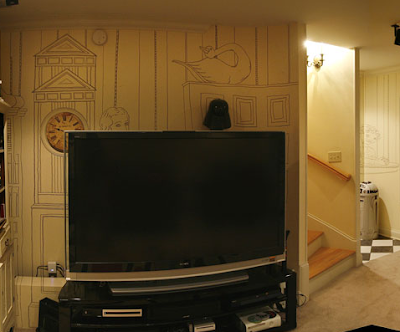 Eyeteeth: Incisive ideas: Home improvement on a financial-crisis budget: Sharpie-drawn wallpaper! 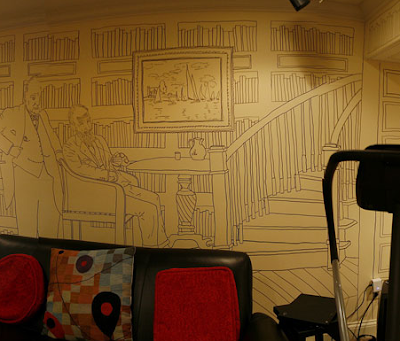 Home improvement on a financial-crisis budget: Sharpie-drawn wallpaper! OK, this Lexington, KY, resident doesn't seem to be hurting -- he's got some pricey-looking exercise equipment and a pool table -- but his home decorating idea can work for those of us not so flush: He used $10 worth of Sharpie markers to draw a mural on his walls.Resident Charles Kratzer's imagery runs from Shakespeare references to Georges Seurat's Sunday Afternoon on the Island of La Grande Jatte to a dome-lid trash-can transformed via Sharpie into R2-D2.